The Greek economy, a consistent issue over the last five years, has experienced dramatic change through the past few months. Since the ascension of SYRIZA to government in 2015, the policy of Greece in relation to Europe has changed dramatically. The lack of money not earmarked for debt payments has meant that SYRIZA, a radical-left party, has been unable to fulfil its promises to increase public spending. Despite this, the new government led by Prime Minister Alexis Tsipras has adopted a more confrontational attitude to the European authorities, and has requested that the terms of the bailouts be loosened. This attitude meant that a new bailout settlement, which would be required before June 30, 2015, would be harder to get. A bailout would be necessary by this time in order to allow Greece to pay their € 1.5 billion (AUD $2.2 billion) repayment to the International Monetary Fund: failing to pay back this would put Greece significantly in arrears with the IMF, a first for a developed country. It would also mean that it would be hard for Greece to stay in the Eurozone. In the months before the deadlines, multiple summits of European and Greek politicians failed to meet an agreement, with Tsipras and Greek Finance Minister Yannis Varoufakis wanting no cuts to Greece, and European politicians wanting more cuts. On June 25, the European Union offered a proposal to the Greek government. In exchange for an extension of the bailout, and the guarantee of the IMF payment, Greece would broaden their value-added tax (Goods and Services Tax, to Australians) top rate of 23% to increase restaurants, hotels, and catering. A limited set of goods would be covered by a 13% rate, such as water, electricity and basic foods, and a super-reduced rate of 6% would be introduced for books, theatre performances, and medical supplies. Pension contributions would also be increased, and grants designed to increase government funds to less well-off pensioners would be phased out. The full text of the proposal can be found here. This deal offered a dilemma to Tsipras. On the one hand, if he accepted it, he would be accused of selling out to the EU. On the other, if he did not, he would be acccused of unilaterally pulling Greece out of the Eurozone, a fairly unpopular move. So, what was the solution? On June 27th, a mere three days before the payment was due, Tsipras announced the solution: a referendum on the proposal. The next day, Parliament passed the referendum law; it received support from the far-right Golden Dawn party, as well as the governing parties of SYRIZA and Independent Greeks. However, it was opposed by the Communist Party, the liberal To Potami (The River) party, the centre-right New Democracy party, and the centre-left Panhellinic Socialist Movement (PASOK) party. The date for the referendum was set for the fifth of July, only seven days after the bill was passed. The intention of this was apparently so the European Union could extend their bailout to cover the repayment due on the 30th. So, what are Greeks being asked? The exact question, as translated by the BBC, is this. Should the plan of agreement be accepted, which was submitted by the European Commission, the European Central Bank, and the International Monetary Fund in the Eurogroup (meeting of European finance ministers) of 25/06/2015, and comprises of two parts, which constitutes their unified proposal. The first document is entitled "Reforms for completion of the Common Programme and beyond", and the second "Preliminary Debt Sustainability Analysis". I can only assume it sounds better in Greek. Now, this is quite a long question for the proposal on offer. Those who have read the documents will know when they were presented and who presented them, and those who haven't won't know about the referendum anyway. The question seems unnecessarily detailed, and I can't see that asking whether voters simply approve of the documents in question would be any less helpful. This seems somewhat suspicious. The ideal outcome for SYRIZA, who wrote the question, is a no vote. If voters don't understand the question, they are likely to vote 'No', as they quite reasonably don't want to vote for something they don't understand. Other than the overly long question, another issue with the referendum is the placing of the Yes and No boxes. 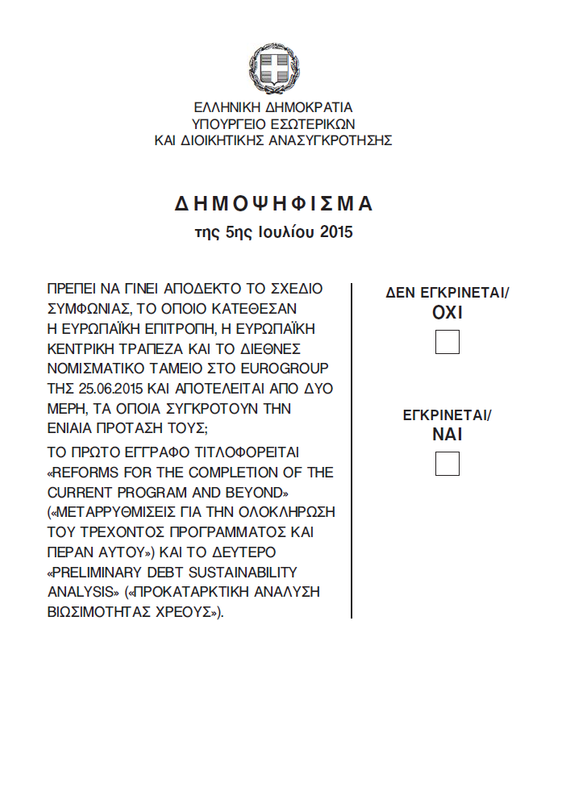 For those who can't read Greek, the box for No is placed above the box for Yes. Now, Greece's last referendum was in 1974, on whether Greece should be a republic or a monarchy. 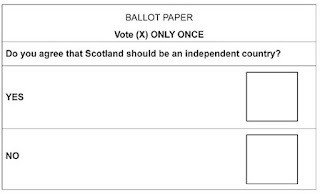 As far as I can tell, this referendum used a system where voters were given an envelope, and then went into the voting booth, where there were a stack of cards reading 'Yes', and a stack of cards reading 'No'. They took one card, put it in the envelope, and put the envelope in the ballot box. 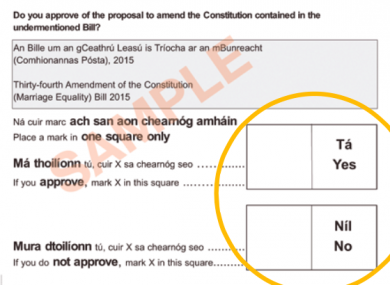 So, there seems to be no Greek practice for how referendums are held. 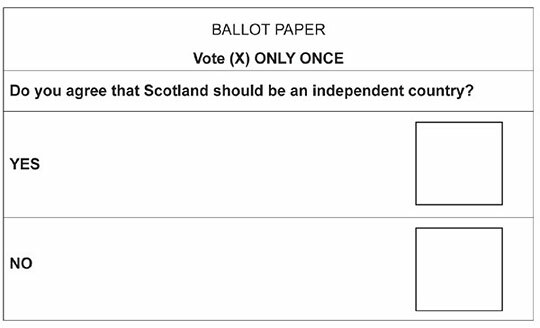 However, on a ballot paper designed by a government interested in a certain outcome, it certainly seems suspicious that the outcome the government wants is on top. It seems especially suspicious considering that standard practice in referendums is usually to have 'Yes' first. Now, this doesn't have to be attributable to malice. But it certainly seems rather odd, and it certainly has attracted attention. The referendum is being held at fairly short notice. While it seems possible that Tsipras is being reasonable by not asking the European Union to extend the bailout over a long campaign period, the fact is that the European Union did refuse to extend the bailout at all. This means that a long campaign period, in order to discuss the issues more thoroughly, would be more popular. Now, some might say that Tsipras isn't to blame here. After all, he might have thought that the European Union would offer an extension, and they wouldn't want too long an extension. However, it is surely a dramatic breakdown in communication when Tsipras is unable to run the concept of a referendum past the European authorities. The government has provided a website, with details of the agreements. However, simply looking at the front page, it's clearly slanted in favour of the No campaign, with Prime Minister Tsipras , a supporter of the No campaign, receiving multiple slots with which to make his statements. Is a referendum a good idea? In theory, allowing Greek voters to choose their future, and whether they support the bailout, isn't a bad idea. However, this referendum has not provided enough time for voters to properly scrutinise it, and the government seems to have slanted the playing field in favour of their preferred option. Excellent overview and points about this very complex predicament !